Over time red foxes have successfully relocated in towns and cities. Foxes that live in cities and towns are commonly known as urban foxes. Urban foxes are the very same as wild rural foxes but they have habituated to the hustle and bustle of city life getting more and more used to humans. 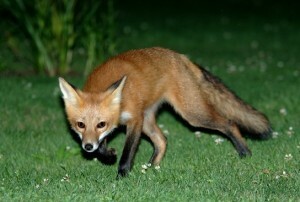 Urban foxes are mostly active at night and early morning but are increasingly becoming more active throughout the day. Urban foxes are natural scavengers and their cunning nature makes them extremely adaptable to city life often living off food scavenged out of bins and rubbish bags. Urban foxes live and breed mostly in scrub and undergrowth be that along rail lines, rivers, derelict gardens, canals or even your garden. The fox population seems to have thrived in cities over recent times, especially in Dublin. A higher density of foxes in Dublin seems to be in the more established areas south of Dublin city and the north inner city. People sometimes misconceive urban foxes to be furry cuddly creatures. This is not the case they can be a pest and a menace. When urban fox numbers reach high levels (such as the urban fox population in Dublin at present) they often come into conflict with humans. Wildlife Management Services have removed many urban foxes annually from the greater Dublin region. We have seen an increase in mangy foxes recently. Sarcoptic mange is a skin disease caused by parasitic mites. Symptoms include hair loss, bald spots, itching and scabbing. Because urban foxes travel from garden to garden able to scale large walls in an almost cat like fashion, the disease is spread quite quickly. This disease can be passed to your household dogs and cats. Foxes are also carriers of toxoplasmosis which can be spread to humans and can be dangerous to pregnant women. Foxes will also soil in your garden and damage landscaping by scraping and digging. Furthermore client’s have unfortunately also had to deal with the upsetting experience of finding a dead fox in their garden. Wildlife Management Services also offers a dead fox removal service and will deal with this in the appropriate manner. Urban foxes are not currently protected in Ireland and may be controlled in order to prevent health and safety hazards. 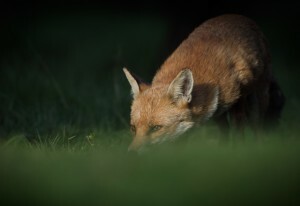 Wildlife Management Services have been providing urban fox control in the greater Dublin region for the last 10 years and are experts in the field. Please also view our page on urban fox proofing for further information. Please contact us at 087 6410206, 057 8623042 with your fox problem.